Master at a glance is a film filled with reputable actors and complicated story line; who would have thought that two-and-a-half hour could pass by unnoticed? 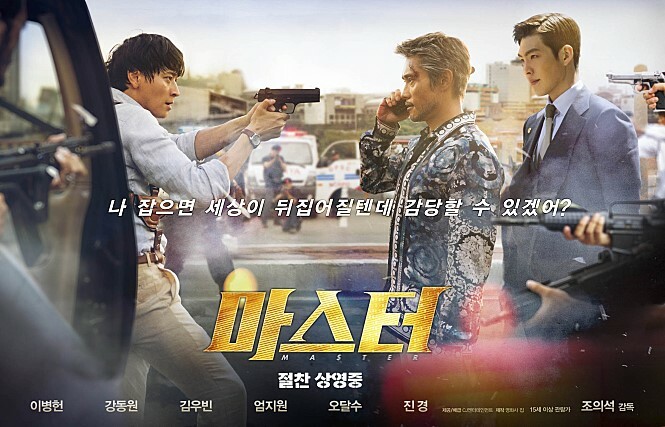 Starring A-list actors Kang Dong Won, Lee Byung Hun, and Kim Woo Bin, the film started grand, paving its background slowly as it reveals the connections between roles. Then, twists happened. And I am not talking about one, nor two, but several plot twists until the end. When we got invited by CGV to the film premiere I thought this could be another The Technicians (기숙자들), but I was fooled by Kim Woobin’s wearing suit; Master really flips your expectation around. Spoiler much? Don’t worry, there is much more that Master offers to its’ audience. Complicated background story of financial scam based on IT? Age of the geek, baby! Capable actors with poker faces? Nailed it. Smart humor every now and then? Master’s got it. This film has got six million audience in Korea and is gaining more worldwide, grab your tickets now!